Nintendo of America will be releasing an absolutely adorable mini NES in November, so it just makes sense that Japan is getting its own baby Famicom. 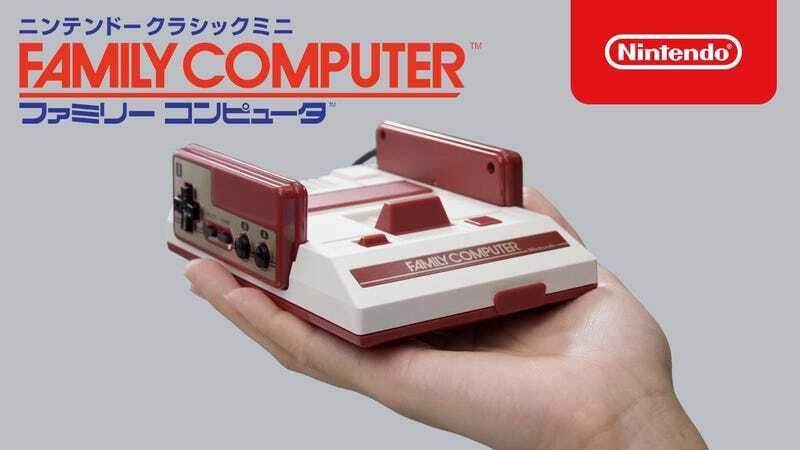 The concept is essentially identical—miniaturized Famicom console that connects to your TV via HDMI. It has two wired controllers (and check out that classic Famicom red) and it comes loaded with 30 games. Some of the games are the same as what will be on the US edition (Super Mario Bros., Super Mario Bros. 3, Dr. Mario), but there are some differences too. Instead of Tecmo Bowl, there’s a sumo game. And Super Mario Bros. 2 gets its Japanese name, Super Mario USA. It’ll sell for ¥5980 (about $60 USD) and be available on November 10. To my great regret, it’s only available in Japan. But that will not stop me from importing one of these things for an exorbitant price on eBay.